Players from the following countries are not eligible for the deposit bonus: Poland, Greece, France, Hungary, Romania, Croatia, Ukraine, India, Pakistan, Indonesia, Russia, Czech Republic, Slovakia, Latvia and Spain. *You are not allowed to wager more than €7.50 (75kr, $7.50) per bet until you've met the play-through requirements. All bonuses and free cash bonuses will expire after a period of 30 days. If you want to contact the casino by telephone note that it does not list any telephone numbers on its website. It only has a call back option where you must fill in your telephone number, name and email address. Support can be contacted 24/7 by any of these methods. ”With its multi-facet software platform, ongoing promotions to returning players and fast payouts, Guts is our go to online casino”. Guts Casino is so new to the world of online gambling you can still smell the paint on its virtual wall! Without a doubt one of the most stylish internet casinos we’ve come across of late. It’s awash with eye-popping visuals backed by a straightforward user-interface. Guts is powered by the best software providers in the business. They are Betsoft, Evolution Gaming, IGT, Microgaming, Net Entertainment, OMI, Sheriff, NYX, NextGen, Leander, Rabcat and Quick Spin. Mold all these software vendors together and the stage is set for one heck of a gaming experience. While playing your favourite slots machine or table game you can chat to fellow players if you like. The game selection boasts a huge amount of video slots machines (classics, 3 and 5 reel varieties), table games, video pokers, mobile gaming, progressive jackpots and specialty games. The software client is ‘Instant Play’. In other words you can start playing immediately which is great. When it comes to its promotions Guts Casino does not disappoint, as a matter of fact it’s quite generous. If you want to double your deposit you’ll receive a lucrative sign on bonus of 100% up to €300 (Bonus Code: GUTSB1) spread over 4 deposits plus 100 Free Spins to play Starburst. I’d like to add that there are no wagering requirements on the free spins. Every Wednesday the operator runs a free spins promotion where it gives away thousands of free spins. Make sure that you don’t miss out on this one-of-a-kind promotion. Before the sign on bonus can be claimed you must provide each bonus code first. If you accept the bonus, before a cash out can be made it must be rolled over 35 times. Games that count 100% towards the completion of the play-through are all slots and other games. To ‘unlock’ the bonus you must deposit $€20 or more. The operator adheres to a strict responsible gambling policy. A self-exclusion option is available to problem gamblers who can self-exclude themselves from the casino for a period of up to 6 months. You can even set your own deposit and session limits if you’re on a budget. Rest assured that all your queries will be addressed in a timely and proficient manner. Guts is contactable through live chat or e-mail. It has a call back option, the operator will return your phone call at its own cost. A FAQs is available to new players. It covers questions about deposits and withdrawals, security, how to register an account, what to to when a game freezes and so forth. 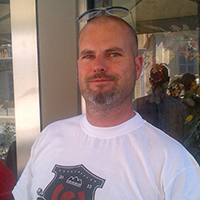 Described as one of the most successful casino launches in iGaming history, Guts.com emerged on 22 May, 2013. Many players dubbed it the ‘next big thing’. How did the award-winning launch come to fruition? Having been in the affiliate business since 2005, founders Robin Reed and Frode Fagerli finally realized their dream of launching their own gaming brand. Coming from a player and affiliate background they felt that their perspective differed from other online casinos. They believed that things could be done differently. The Norwegian duo teamed up with seasoned casino manager Ben Clemes and Sports Book wunderkind Anders Berntsen. The four founders share a common vision for the e-gambling industry and their goal is to set a benchmark for others to emulate: ”Treat the players right.” Guts was received well and the word quickly got around in the iGaming community that a new star was born. The first year of operation was a huge success with massive organic traffic, key affiliates signings and over 50,000 players signing up. In summary. With a safe and user-friendly environment to wager in, Guts offers a unique sign on bonus with low wagering, multiple deposit methods, an ocean of games and a tiered VIP program. It is licensed in Malta-a leading jurisdiction powering online gambling sites worldwide. Highly recommended. 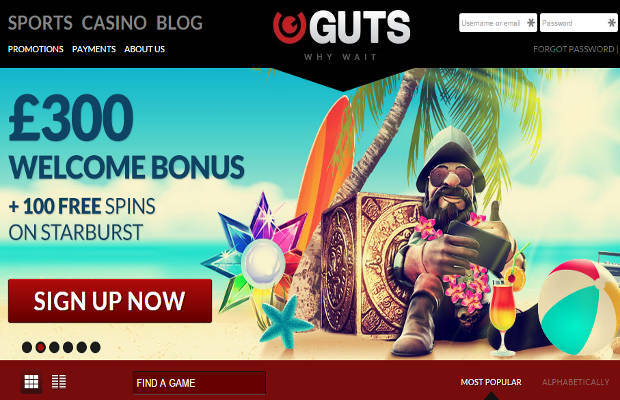 To attract new customers Guts Casino offers a deposit bonus, regular promotions and a VIP program to returning players. Welcome Bonus: The bonus of 100% up to €300 + 100 free spins is optional. It is divided into three bonus offers. The first is a 100% match bonus up to €100 bonus + 25 free spins to play Starburst. Before you can claim the bonus you must provide the following bonus code first GUTSB1. The second bonus is 50% up to €50 plus 25 free spins(Bonus Code: GUTSB2). The third is 25% up to €50 bonus + 25 free spins on Starburst (Bonus Code: GUTsB3) and the fourth bonus is 100% up to €100 plus 25 free spins (Bonus Code: GUTSB4). Alternative Deposit Bonus: If you are not interested in the above mentioned bonus, Guts offers you 100 free spins to wager on Starburst. With a single spin you can win as much as 50,000 coins! To see which deposit and withdrawal options are available to your country you must login to your account first. Deposit methods: Credit Cards such as Visa, MasterCard and EntroPay. E-wallets like Neteller, Moneybookers and Webmoney. Prepaid Cards such Ukash and paysafecard. If you don’t want to be saddled up with processing time you can use Instant Banking options such as Euteller and Gluepay. The last deposit method is Bank Transfer. The minimum deposit is €10 and the maximum is €5,000. Withdrawal options: Visa, MasterCard, Bank Transfer, Neteller, Moneybookers, Entropay, Webmoney and Ukash. For what it’s worth, Guts states that it clears all withdrawals requests within 2 hours. Note: A withdrawal fee of €2.50 will be charged for every transaction you make. The maximum withdrawal amount per transaction is €2,000. Withdrawals are processed within 1 to 3 business days or within two hours-it depends on the deposit option used. *If you request a withdrawal of €2,300 or more you must provide the following documents: Passport or National identity card, your drivers license accompanied with your latest gas, telephone or insurance bill. As well as a bank or credit card statement. These documents must be less than 3 months old. The casino will notify you through its newsletter if any bonuses, comps or free spins are available. With a compendium of 800 casino games, the operator uses software providers like Betsoft, Microgaming Quickfire, IGT, OMI Gaming and Sheriff Gaming. Table game players are in for a treat. Blackjack variants like Blackjack Classic, Double Exposure and Pirate 21 are crowd pleasers. If you fancy Roulette you can try your luck at Zoom Roulette, French Roulette, VIP American just to name but a few. We had a look at the video poker variety, unfortunately only a limited amount is offered at this stage. Old time favourites like Deuces Wild, All American, Bonus Poker and Aces and Eights grace the menu too. When it comes to progressive jackpot networks, Guts has 36 progressives in its tally. At the time of writing progressive games that caught our eye were Mega Moolah, Mega Fortune, Mega Moolah Isis and Hall of Gods. They offer jackpots amounting to 7-figures. The rest of the progressive games offer smaller payouts. Sushi Bar, Silent Run Starburst, Gonzos Quest, Immortal Romance, Blackjack Classic, Battlestar Galactica, Safari Sam and Jack and the Beanstalk. Not only are the graphics and animations in these games exquisite but they offer regular payouts albeit small. The average return to the player is 96.6% for all its games. The house takes 3.4%. The house edge or house advantage is the amount of cash you’ll lose on a percentage of your bet. If you wager $50 on a game that has an edge of two percent, you’re going to lose $1 on average for every bet made in that game.